A skirt pattern for crochet or knitting project. How to make it. Do you really have to make a skirt pattern ? Well, not really. But if you do want to avoid wasting your time, you have to make a small sketch of a pattern, based on your measurements. It will look similar to the one, described step by step on this page. Make a gauge swatch for every stitch pattern your are going to use for your project. Check explanation how to do it at the Beginner Crochet page if necessary. Calculate gauge for each of them. 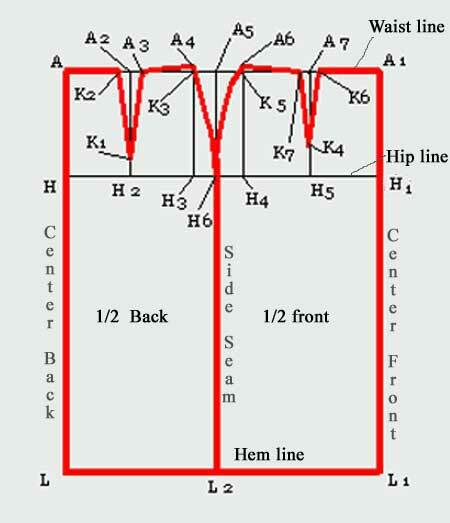 Calculate the number of stitches and rows necessary to shape your fabric according to your skirt pattern. Check Crocheting Basics page for detail instructions. 1.A skirt pattern is designed for crochet or knit projects only. Doesn't work for sewing skirts. 2.It is easier to draw in centimeters than inches during the pattern drafting exercise. 1. Hip circumference (Line "H") - measure around the fullest part of the hips. 2. Waist circumference (Line "A") - measure around the waist. We will draw a pattern where 1/2 of the back plus 1/2 of the front skirt pattern is presented. Hip circumference HC = 102 cm (40 in). Waist circumference WC = 72 cm ( 28 in). Skirt length SL = 65 cm (26 in). Distance AH = HC / 6 = 102 cm / 6 = 17cm (40 in). Position of the back dart. Position of the side seam. Position of the front dart. Step 3. Draw 1/2 of the back part. Distance AK3 on the waist line. Distance K3A4 is perpendicular to the waist line. A - K2 - K1 - A3 - A4 - H6 - L2 -L - H - A. Step 4. Draw 1/2 of the front part. Distance A1K5 on the waist line. Distance K5A6 is perpendicular to the waist line. A1 - H1 - L1 - L2 - H6 - A6 - K7 -K4 - K6 - A1. Gore Skirt Pattern: Easy to do. Crochet a Skirt of motifs: Easy and fun project.